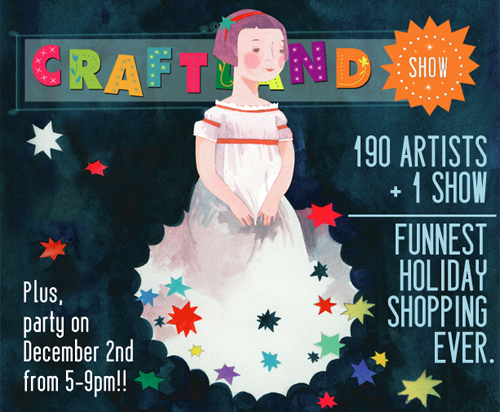 We’re really hoping you’ll join us for the 9th Annual Craftland Holiday Show Super Celebration Bash! The first 300 shoppers receive highly-coveted GOODIE BAGS stuffed with quality samples, magazines, coupons and more. Plus delicious SNACKS from Julian’s, and delicious BEER from Trinity! Demo and BOOKSIGNING by Jennifer Cooke from Raeburn Ink! And lots and lots of amazing work by 200 independent ARTISTS. So mark your calendar and start picking out your par-tay clothes. Feel free to RSVP here!